Hello Khris I came across your blog when I became curious as to the shootings in Conn and decided to look in to it and googled Adam Lanza and MK Ultra. I became awake from the deception we are fed and shoved down our throats almost two years now, and although i dont think i have ever been programmed or have had any type of mind control done to me besides the frequencies being sent through radio and tv airwaves. first i want to say thanks for being able to share your experiences. i have become very intrigued by your blog as i have been looking for some concrete information that can back up what i feel is the truth so many shoot down when i speak to them about because they are still asleep and just think of me as a conspiracy theorist or just plain crazy. I have a couple question i want to ask if you dont mind me asking. i have spent numerous hours and days looking up information about the truth that is suppressed in our sick, evil, wicked society we live in and i came across alot of stuff from aliens, reptilians MK Ultra, NWO, FEMA, Satanist, Lucefirians, ect. and have always wondered about the alien aspect if it was true or false i believe theres numerous beings out there and have wondered if i was tied to them somehow or was i just another “human” being that has been placed here as collateral during the great epic war that will happen during the end times. so the question is what truth is there with aliens, DRACOs, Annunaki and creation of man? if you happen to know the answer or anyone that would know. second question is are every military individual programmed for specific jobs or is it a select number or people as i have had or do have friends and family in military and do see some slight differences in the way they act. third and final question is how do i know if i have ever been programmed to some extent and why have i been one of the few to have woken up from this? at times i feel like i wish i didnt it kind of worries me of what is to come and with a child it scares to think of what can happen. I also have some thought about there being a truth to every lie and this is pretty much pertaining to movies and tv, when i see movies like V about reptilian aliens who came to earth to gather our resources or this zombie phenomenon makes me think that this will happen in the near future. June 17, 2012 - 10:05 PM Caroline K.
Hmm… seems real. Thanks for sharing! Anytime! I’ll arrange a journey for you! Khris, don’t laugh but I want to go to Neptune. I think I have many allies there. I want to be around beings I can trust and who know me. I have Neptune’s energy being a double Pisces. Neptune sounds great. I hope your star family does find and contact you! Pieces is an interesting energy! I have known many and they stand out in my opinion. Khris, do you know or have a theory as to why you are on this planet now? We I guess my answer to that is almost exactly like Duncan says his reason for being here is. I am here from somewhere else for a big war/battle and when that’s over, I go home. I’ve been in every major battle for thousands of years though. My good friend can see my past while doing Reiki on me. We’ve reviewed the civil war and all the way back to the Incan time frame. I’m having feelings coming through of being around during Alexander the Great. That was interesting a few weeks ago when I ask my grand mother her maiden name and she said Phillips. As the Alexander the Great stuff had been bouncing around for a few months before that. I hope this helps some. I find this “Final Battle” scenario irksome and tiresome. How many “Final Battles” has there already been?? How many “Final Battles” does it take to end the enslavement of this planet?? I don’t disagree with you Pollyann. That’s what I’ve seen and been told. I was told this planet was holding the whole system back in advancement and the last battle was set. Those who still want to control and manipulate after would be shipped somewhere else in the universe. I just want to get this particular battle over and retire my sword. I think it’s quite pitted, rusted and bloody enough. Please don’t be upset with me, it’s all I know right now. I’m sure more will be revealed in the coming weeks and months. I did see myself in the coming years helping in ways that weren’t fighting. My sense, too, is that what is going on in this solar system is holding everything back which is why it is such a focal point now. I’m not upset with you, I’m upset that it is taking sooooooooooooooooooo darn long to correct. I ran out of patience years ago. Things are intentionally and extremely confusing so we all have to proceed the best we can. That’s what I mean about gold — there is nothing scarce or sought after about it. It’s just another deception to manipulate people’s minds and behaviors. Haha, I can’t be for sure 100% which ship it is. I talked to Cynthia Crawford on the phone and sent her a picture. She said she picked up on a strong Syrian Warrior of Light connection with me. I felt more attracted to her Blue Arcturian statues than any other. The Sirians have talked to me before, but I didn’t understand their language. Cynthia played a record of them and it was exactly what I heard. She told me to be patient as others had heard the unknown language and after a few experiences they could understand and speak it too. At this point in time, I’m very sincere and just relay what I’ve seen and learned so far. I have no reason to use deception or anything like that. I wouldn’t even try it. I don’t think the photos were Blue Beam as I was guided internally to go out and take the photos and the ship wasn’t visible to the naked eye. I hope with all my heart I’m not on a corrupt team, but it’s hard to tell what’s what anymore. The government has interjected so much disinformation into the E.T. and U.F.O situation that I never know who’s who. Yeah, the gold myth is annoying. The beings I know about can materialize or manifest gold right out of thin air. Why bother with tainted gold from a discordant planet? Can you say any more about this object, Khris? Did you see it more than once? I’ve never seen it with my physical eyes. I know I’ve been on the ship more than one time. The beings actually call me captain. They are very loving. Sadly, when I get back into my body, I can remember being on the ship but never what I saw. A beloved friend of mind could see it and she was telling me about it. In 2010, we knew a ship was nearby because of the disturbance to the atmosphere it would create as well as noises coming from that area. 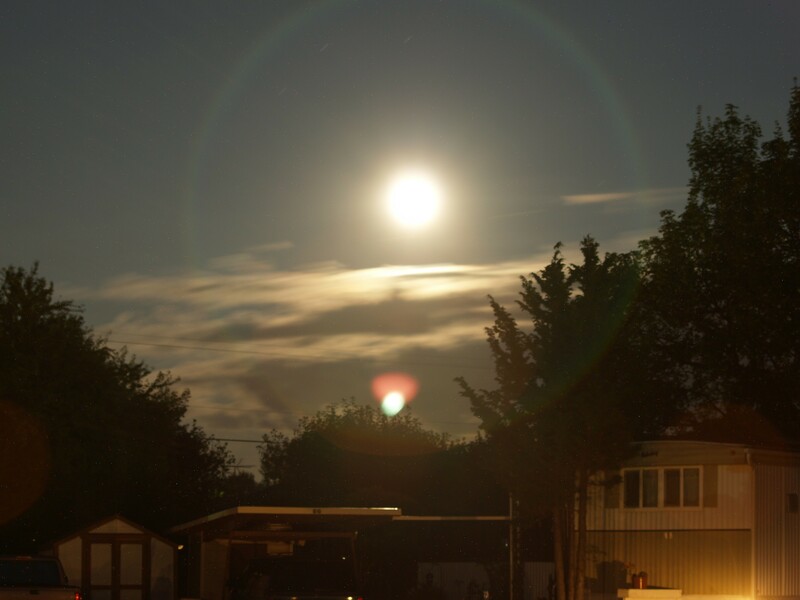 I decided to take photos of the moon in August of 2011 and that is what showed up. The photo was taken with an Olympus E-Volt E330 DSLR camera. It was taken with a sixty second shutter speed. You have to use a tripod when using shutter speeds that slow. I couldn’t believe what I was seeing. I took several more, but the image you see was the best. I have talked to a few people about it. I have been told it is more than likely and Arcturian ship, but it might be a Sirian ship from Sirius. The beings on the ship of light aren’t interested in gold or harvesting souls, but I might not be able to convince people of this. To be honest, this picture has got more hits on my blog than the MK-Ultra topics. I believe they have protected me as I have been under attack a few times and friendly invisible forces have showed up and blasted something/someone on more than one occasion. We have had voices that sound like snakes or serpents walking down the street. When that happens there is a very sinister vibe in the air. I heard them and so did my friend. When those serpent voices show up, you can sometimes smell sulfur in the area. The ship was always around when the serpents could be smelled and heard. I think the ship was here to help protect both my friend and myself. I never saw the beings, but I’m assuming they were reptiles. It appears certain forces would rather I not be around anymore. Thank you, Captain Khris. 🙂 I’m glad I decided to ask. This is very interesting. If I were you I would hope this is an Arcturian ship and not a Sirian ship. The Sirian-A’s have been playing both sides of the fence for a long time from what I understand and I would not trust them. They are quite unemotional in nature and incapable of love. They only acknowledge the mental forces as being valid. I do feel a trust in you and do not detect any Sirian energy involved. We all have learned to be so skeptical because of the depth of deception and corruption on this planet so Blue Beam would come to mind for many, as it did me, when viewing your photos. I believe what you have to say now that you have given me an explanation. I have studied your pictures several times and keep coming back to them. It’s nice that you have back-up; something we all need. Other people have reported a sulphur smell when reptilian beings are around so there is collaboration for that. That whole gold myth concerning this planet started years ago is a load of garbage, I think. I never bought it.